Note: This is edited part of newsletter sent to my subscribers on 20th of August 2015. Today I got an interesting email from one trader who took my course. 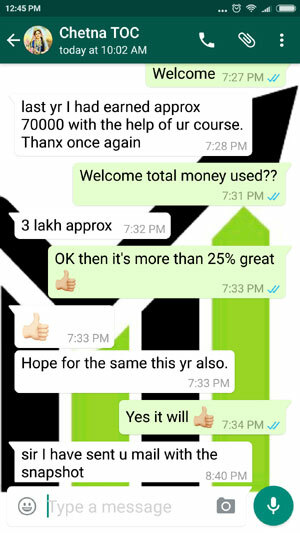 On 16th of July 2015, he had bought Nifty Future @ 8626, and on 28th of July he sold it @ 8350. If it was a naked Future trade (a trade without hedge) he would have lost 8350-8626 = (-)276 points – that’s a lot of points. But overall when he closed it, he was in 50 points profit – which comes to around 5% of margin blocked in 12 days. Yet he was NOT happy. 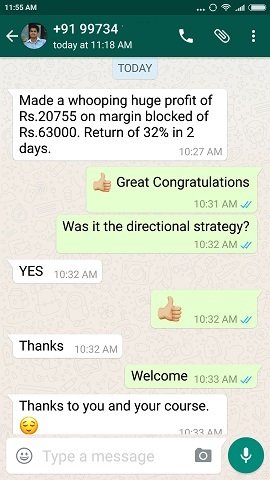 After doing calculation in this trade getting 50 point minus charges around 30 point so only saving is 20 point even nifty future moved 276 point. This is what I call GREED. You take courses for 15,000 or more and when you trade them you make losses or find out that the strategy cannot be traded in live markets. 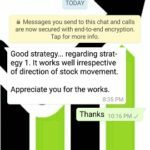 Now you took a course for much less – your trade went horribly wrong – you still made 5% profit in 12 days, but you are cribbing on why this strategy did not make more? Isn’t this Greed? I cannot understand where this greed ends? I mean tell any experienced stock trader that you took a Future trade and lost 276 points but still ended up with a 5% profit on margin blocked in under 12 days. I swear he will first stand and ask “What exactly did you do?”. And this guy is complaining why the strategy did not make more? How much more you want Mr. Jha? Please tell me. I am sure he will NOT be satisfied even if he makes 10% on that trade. You made money when you were WRONG – that’s it be happy – do not look at how much. The directional strategy is meant for that. If you are right its obvious you will make money, if you are wrong you can still make money – but it does not promise how much. You can lose money if the stock is in very narrow range and is going against the Future, however the loss will be limited. Since the whole thing is totally hedged by options you can always wait for the Future to reverse direction and hit the target. That’s the benefit of the hedged trades. Therefore I strongly recommended hedging all your Future and Options trade. Read this article to know how to hedge a Future trade. I feel hedging is better than stop loss. But that’s my opinion. I have written about it here and here. I would be happy to take no loss when wrong in a Future trade. Dude, my prediction went horribly wrong – yet I am getting out in break even – hell I should be happy right? If you really want to be a happy trader its very important that you be happy with even a small profit of 1% especially if that has come under 15 days because that converts to 2% a month. That’s more that enough if you can consistently make them and restrict the losses. The best way to avoid being unhappy is NOT to look back at the trade on the expiry day and think what would have happened had you left the trade till the expiry day. The trade is over and looking back will only be painful, of course it can bring joys if it would have lost more. But it does not make any sense. As you can see these things are a waste of time unless you are researching a strategy. The problem is these emotions can alter the way you trade. 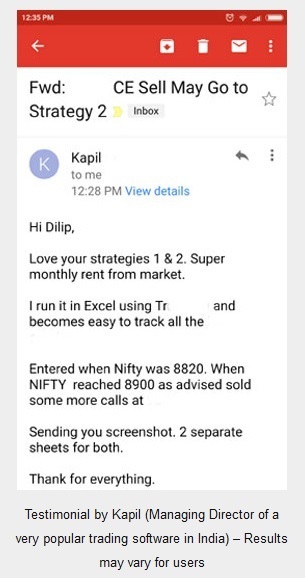 For example if you see that a trade that you closed in loss would have made huge profits had you left it till expiry will change your plan for the next trade. Unfortunately next time you may leave it as it is and not take a stop loss only to see it made huge losses on the expiry day. 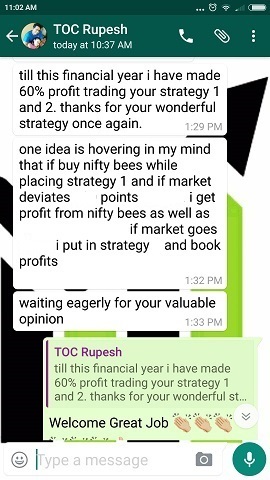 Therefore once I have experimented and researched a strategy, I never look back and see what may have happened had I left the strategy till expiry day. For me once the trade is over I move on. But if the trade taught me something I will write it down, where I write results of all the trades so that I do not repeat the same mistake again. To end this is my advice – control you losses (by hedging or stop loss) and be happy with the profits – even if small. Just don’t let greed overcome you – else you will never be a happy trader. Its highly recommended that you do not trade Futures without hedging, however if you trade naked positional Futures you should take this course. It will help you a lot. I have observed that the directional strategy of Future + Options works better in last two weeks of the series. In the first two weeks, the current week option premium is high and the strategy is less profitable. Have you seen / observed similar behavior? Deepak, never researched on this. Ok will check – but I think when you take time out you are more relaxed as the chances of the Future hitting your target is more than in the last 10-15 days. In the last 15 days the movement has to come fast – though it comes, I agree, but I would like to take my time. Anyway, thanks for the insight will look into this. Control you losses (by hedging or stop loss) and be happy with the profits – even if small. Just donâ€™t let greed overcome you – else you will never be a happy trader. Sorry comment repeated as Net connection was erratic.